Is this FAKE or unofficial Manson merch? Thread: Is this FAKE or unofficial Manson merch? 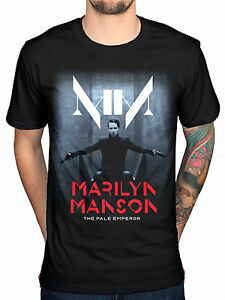 Im trying to find some Manson shirts for the album The Pale Emperor, shirt designs I like. I got into Manson a year ago so I am not aware of what merch they were selling on Manson's website or what have you during the release of The Pale Emperor. Its got a shirt I would like but are these legit official shirts? I know there is a lot of bootleg Manson stuff all over the web. It looks cool but also kind of different than the other Manson shirts Ive seen and is only being sold on amazon or ebay and i get the sensation the design is a bootleg. So if anyone can tell me if any of these are official merch or not Id really like to know! The first one is official, at least the design. But since it's from a 3rd party site, there's a chance it's a bootleg. I've bought many shirts with the same designs of official mercy but we're really low quality.